Collect all the different type of Rabbits during a series of event that will be live during the entire duration of the Tale. If you manage to collect 5 of each type you will then be able to access the progressive event and have a chance to get Gorg! Help Gorg to COLLECT all types of Rabbits: 5x Chocolate, 5x Gold, 5x Wood, 5x Candy and 5x Ice. 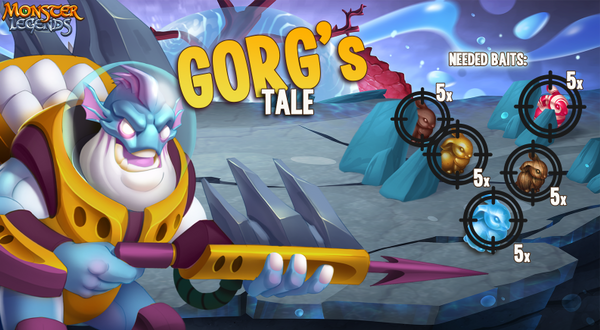 Fight through Gorg's Tales Progressive event and hire his services by collecting his cells! Gorg is a fast Water Attacker with a skill set designed to disarm enemies from positive status effects before attacking. He can apply Tortures (Poison, Drowned and Shock) to the enemies as well as some debuffs (Daze and Guard Down). Additionally, he has several extra turn skills with both single and area attacks, and several self-buff attacks in which he applies Sea Hater to himself, along with Precision or True Vision. His Trait is Freeze Immunity and he applies Shock to all enemies at the start of the battle. But where are the bunnies hiding? They are sneaky little monsters so we will show you where to find them.